Happily ever after begins with a wedding on Hilton Head Island. Our experienced wedding planners specialize in traditional or themed weddings and can work with any budget or party size. 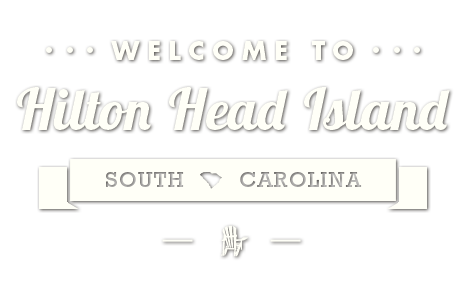 Hilton Head Island’s dedicated planners, cake designers, florists, photographers, and caterers want to create the ceremony and reception of your dreams in one of the most beautiful places in the world. Offering Private Weddings, rehearsal dinners, church groups, company parties, family reunions, birthdays, anniversaries, theme parties or presentations. 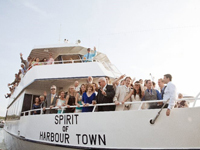 Call Captain Sonny for your private wedding or other activity on the water. 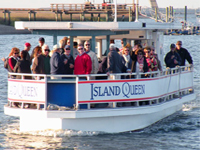 This is our 26th year doing water tours on Hilton Head Island. Exchange vows among dolphins, in a dramatic and breathtaking Lowcountry setting. Vagabond Cruise helps transform your special day into a one-of-a-kind wedding celebration that is unique, modern, and most memorable. We make a personal commitment to you because we want you and your guests to remember your wedding as the most important one ever held. It is – it’s yours! 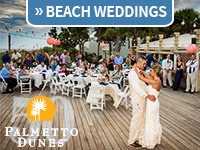 Our friendly and accommodating staff at Palmetto Dunes Oceanfront Resort is pleased to assist a bride and her guests from the initial wedding inquiry, though the couple’s last dance. The resort is home to a variety of beautiful venues for bridal luncheons, rehearsal dinners, groom’s golf outings, wedding ceremonies and wedding receptions. Dunes Catering & Events, the on-site catering team, can help with menu selection, create a custom wedding menu perfect for each individual couple or cater to an off-site location. We can’t wait to make your wedding dreams a reality.